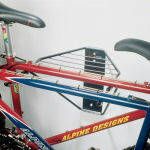 Like the one-bike folding bike rack, this bike rack was built with the idea of space saving storage in mind. It is a wall-mounted unit with a grooved carrier arm that enables you two store two bikes off the floor and against the wall thereby maximizing the valuable space in your garage. The highlight of this rack is its ability to fold up the shelf flat against the wall when it’s not in use. This is nice so nobody gets hooked on it or hits their head on it as they walk by. The integrated shelf is great for storing your other biking accessories such as helmet, bike lock, or shoes. The folding bike rack is a sturdy solid steel construction that has a rust resistant durable epoxy finish that is built to last. Installation is simple and can be accomplished with the provided hardware – no assembly required. Simply identify the spot on the wall that you’d like to hang your bike from, and mount the unit following the provided instructions. Fits two mountain bikes just fine side by side…and easy to install. This is one of the few horizontal bike storage rack. It is easy to install, saves space. It was the best pick for me and it is sturdy, can hold most bike easily.I will recommend this to anyone to like to store their bike horizontally. Great item for anyone with bicycles who want them out of the way but instantly at hand. Great space saver, easy to install and a fantastic price!